So for the body shape I baked a cake mix in two loaf pans and stacked the layers atop each other à la last year’s Mystery Machine cake. (I didn’t raise it off the tray, though. Perry’s resting.) 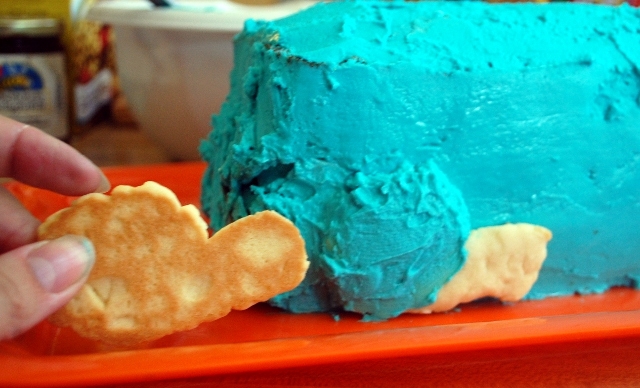 I used a Yellow Cake mix and added about 45 drops of blue food coloring to the batter, which means that when we cut pieces out of the cake they were a convincing Perry teal. Greg suggested that this was somehow morbid, but I replied that it wasn’t nearly as morbid as red velvet cake would be. Haha. SO! For the bill,tail, legs, and eyes I decided to use sugar cookies instead of fondant. (I’ve never used fondant before, and it seemed safer not to experiment the day of the party.) I used this recipe, which I highly recommend. The cookies barely spread at all, meaning that you can cut the shapes you need out of the dough and it will still be the right size once it’s cooked. Also, since it doesn’t puff or spread, details impressed into the dough will still be sharply visible after cooking. Finally, the recipe is intentionally not very sweet, so that when it’s used with frosting the results won’t burn your tongue with the sugar. I like it. I just traced out the shapes I needed on some paper, cut them out, laid them on the rolled-out dough (TIP: flour the dough a bit before you lay paper on it. Sigh.) and cut around them with a knife. To keep the bill from falling off, I made it with a long thick piece to be stuck in between the cake layers. Also, I decided to stack two cookies together for the bill, so I cut out two of those. It seemed to work well. You may notice that the cookie on the bottom is – as my grandmother would say – ‘darkly brown,’ while the cookie on top is not. See? Being a blogger isn’t all link parties and artful balloon clusters. Sometimes it’s hiding a burned cookie with frosting and then admitting that you did that on the internet. Here’s a shot of the back leg cookie-shape and how I stuck it on the cake. You can see how imprecise and rough my shape was. Stuck on a cake and covered in frosting, you can’t tell. 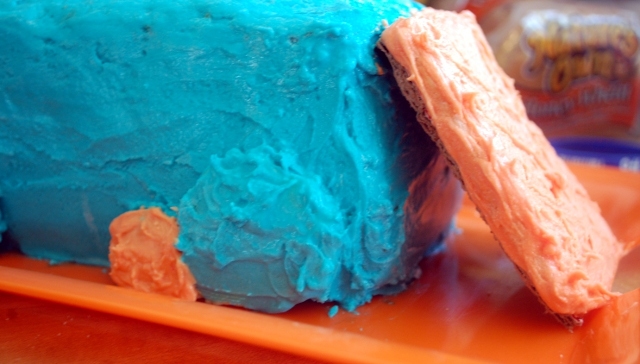 Since these are the back legs, I only covered half with the blue frosting. And here we see both legs attached! Then it was time for the orange frosting. I had thought that the tail would stand up, no problem, but as I watched, it slooooowly began to bend in the middle, then to crack. Desperate to avoid baking a third batch of platypus body parts, I quickly removed it and cut a piece of cardboard to support the tail. Whew. Then, once orange frosting has been applied to the bill, the tail, and the back feet, all that remains is the eyes. The eyes were just little oval cookies covered in white frosting with dried blueberries stuck on for the pupils. Easy, peasy. The main thing, though, is that he loved it to pieces. This entry was posted in Cooking, How To. Chunky just walked by and declared this one of the coolest cakes ever. I have to agree! This is awesome! My son would love this cake (and that frosting looks so yummy)!! 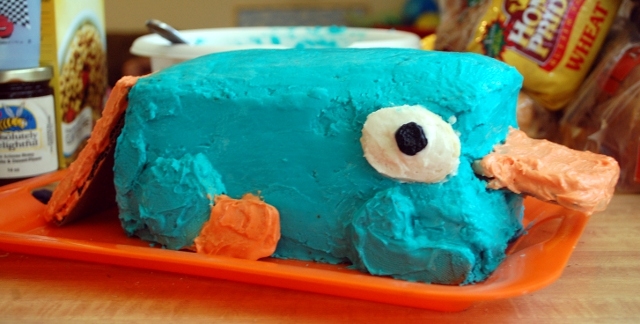 I have been looking for an easy Perry cake, since my food art skills are quite lacking, and this is going to be it!! I’m so glad I found this…thanks for the great tips! My son’s cake is going to be a surprise this year and I can’t wait to unveil it, I just hope it comes out as good as yours!!! Thank you so much for sharing this cake idea! 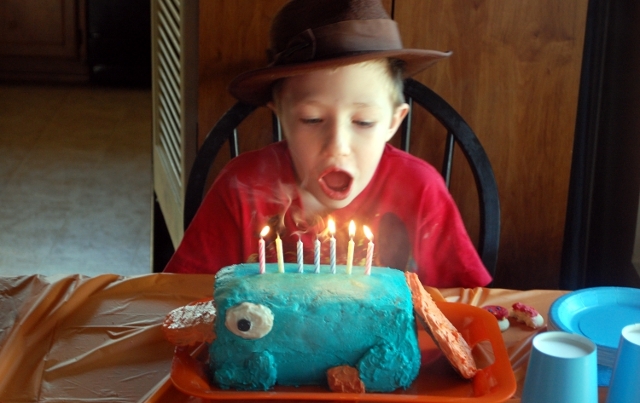 My son is having a Phineas & Ferb party tomorrow and I made the cake today. I’m happy to say that it turned out perfectly – just like yours. I used the cookie recipe that you included and they are delicious. We can’t wait to eat the cake tomorrow! Hooray! I’m so glad to hear that it went well. I love the cake! 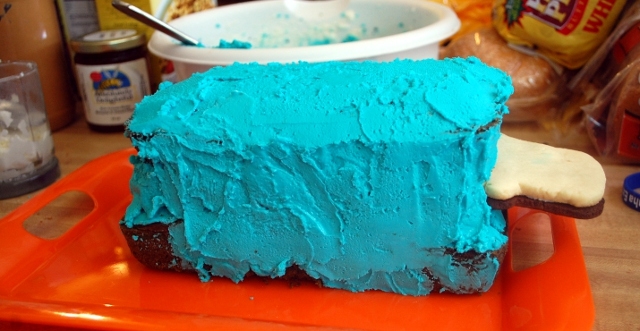 What colors did you mix for the frosting? I actually bought a container of Aqua food coloring from Michael’s for Perry. I used it again for my second son’s Scooby Doo party the next month, so I figured it was money well spent.